Imagine being a fisherman from the small island of Burano, Italy, near Venice, many centuries ago. You return late at night after a hard day dragging nets through ocean waves, and when you leave your boat to walk home, all the houses look the same. 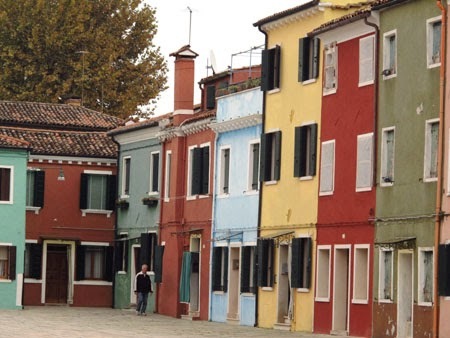 Colorful buildings are a hallmark of Burano, Italy. Local residents (i.e. wives and families) found a solution, so their men would return to the right home: Paint the buildings in vivid, can’t-miss colors of red, yellow, orange, green, purple, and pink. If two families shared the same building, half would be painted one color and the other half a different color, so there’s no mistaking property lines and proper addresses. Today these brightly colored buildings are a main attraction for visitors to the island where many of the 3,000 inhabitants are still fishermen or farmers. 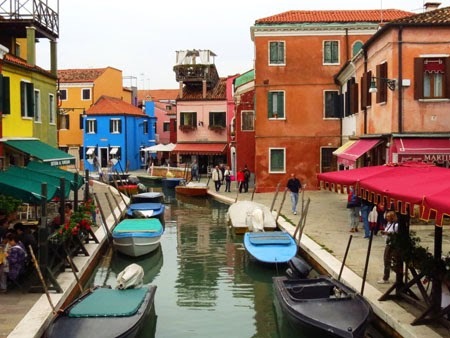 Visitors enjoy dining beside the narrow canals of Burano. Lidia Merletto linen store in Burano. 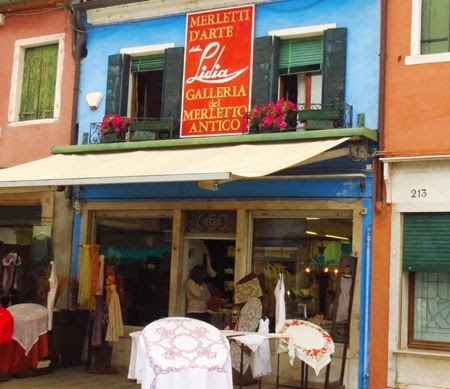 During our visit to Burano, we wandered into several stores featuring beautiful handmade lace and embroidered items. At Lidia Merletto, a charming boutique selling quality linens and lace, we watched a 71-year-old lady demonstrate the skills she learned at age 10 and later developed at a lace-making school. An expert in the craft, her fingers moved deftly over the cloth, weaving in and out to form a variety of artistic designs. 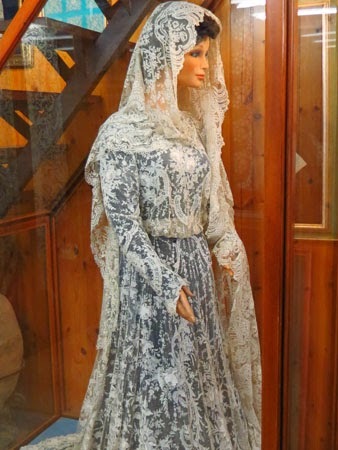 One of many shops featuring exquisite handmade lace items. The store also featured a delightful little gallery displaying lace handcrafts dating back to the 16th century. Actual antique laces with stunningly intricate patterns hung on walls along with photos of notable lace garments. Of course, I couldn’t leave without a reminder of our visit. So I bought a lovely circular handmade piece in a classic ecru color. If it's pizza, it's gotta be good. 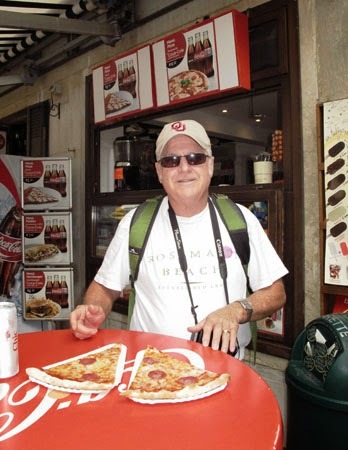 After shopping and walking beside canals and over bridges, we satisfied our Italian hunger with pizza purchased from a street-side stand—dining al fresco while enjoying the warm weather and pleasant people-watching. Before long, it was time to board our boat to return to Venice. Read more of Beverly's travel articles at Austin Adventure Travel and Striped Pot. Hi Beverly, I'm a crafter and have knitted some intricate lace but have never woven it. I hope this isn't too tacky, but how much did lace in that shop cost? Maybe if you could give a ballpark estimation, I could stop thinking about it. What a wonderful opportunity. Thanks.